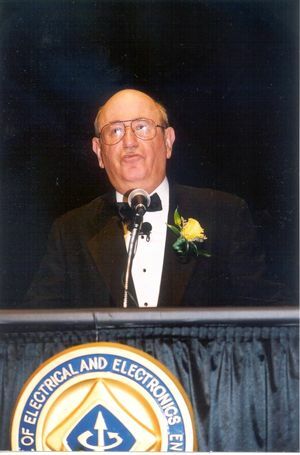 Joel B. Snyder, IEEE President, 2001, has worked on a number of projects including removable media disk memories, voice-over-data modems, and nonlinear sampling techniques. He also has a patent for his research regarding video piracy prevention techniques. Joel Snyder received the BEE and MSEE degrees from the Polytechnic Institute of Brooklyn. Over the course of his career, he worked for Harman Kardon, Airborne Instruments Laboratory, and IBM. He has also taught at Polytechnic University, Brooklyn, New York; the New York Institute of Technology; and Long Island University. He is now a consulting engineer and principal of Snyder Associates in Plainview, New York. Mr. Snyder has done work in removable media disk memories, voice-over-data modems, speech compression techniques, nonlinear sampling techniques, redundant and parallel computer systems, and powered prosthetics. He also holds patents on video piracy prevention techniques. Joel Snyder was IEEE president in 2001. This page was last edited on 29 January 2016, at 18:33.